Kenton Klassen as Mike and John Voth as Danny in the Cave Canem production of Cherry Docs. Photo by Dylan Hamm. It’s not difficult to see why David Gow’s Cherry Docs would be a fit for Vancouver’s Pacific Theatre given its earnest story of redemption and transformation with spiritual undertones. It is just as easy to see why a young company like Cave Canem would tackle it, finding a renewed relevance given recent news cycles on the rise of white nationalism/supremacism. 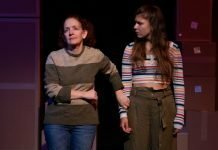 But while on its surface Gow’s sometimes fiery drama ticks the boxes for this second pairing of theatre companies (the first being the much more powerful debut with last year’s The Lonesome West), it only intermittently achieves the intended impact. In this two-hander, Gow brings us polar opposites by pairing Danny, a court-appointed liberal Jewish lawyer, tasked with defending Mike, a neo-Nazi skinhead charged with the murder of an immigrant. The weapon of choice? One only needs to look to Gow’s title for a clue. It isn’t difficult to see where at least one half of this unlikely pairing is headed, and Gow delivers on that promise as Mike moves towards redemption. Somewhat less obvious though, Danny is forced to examine why he is so repulsed by his client. But even while Danny’s transformation is somewhat unexpected in this seemingly predictable set-up, Gow frames it in a less than compelling manner. Unlike Mike’s straight-forward redemption, Danny’s is much more subtle. Relying on small urban incidents, especially when compared to those of his client, Danny’s catalysts for internal examination are relatively superficial. Gow attempts to heighten them through the use of Danny’s Jewish faith and connections to the stories of the prophet Daniel and Archangel Michael, but even these are not enough to make for a satisfyingly believable transformation. The end result is a somewhat lopsided argument for understanding and tolerance on both sides of the ideological spectrum. As Mike’s redemptive transformation quickly becomes an absolute, Danny’s is considerably less impactful. Given the unevenness in Gow’s story, it is perhaps not surprising that the two performances also don’t find balance. 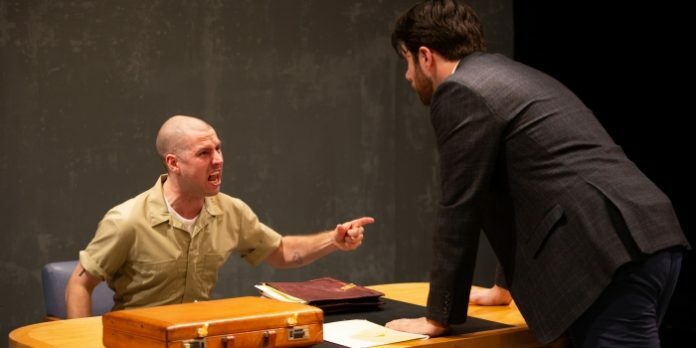 For while Kenton Klassen gives a compellingly real portrayal of the skinhead, under Richard Wolfe’s direction, John Voth never quite finds the same believability in the lawyer, with much of Voth’s performance a direct result of the imbalance in Gow’s story. Told in a combination of dramatic scenes and monologues, much of the power in Cherry Docs comes when the two men come together inside the prison’s interview room. It is here where the vitality of the play really resides. Unfortunately we become distracted by some of the overwrought theatricality in Gow’s script, including a scene where the two breath in unison at opposite ends of the stage. Lighting designer Phil Miguel gets a workout here with almost too many lighting specials to count. The transitions back to the interview room though are stark and effective. Sound designer Matthew MacDonald-Bain adds some intermittent and effective depth to the action at times, including ominous music and heartbeats. Sandy Peter’s set design is serviceable, but even on Pacific Theatre’s tiny alley stage it could have benefited from a greater feeling of confinement. Originally written in 1998, there is a sad realization as to Cherry Docs’ relevance some twenty-years later. Unfortunately, the unevenness ultimately diminishes its impact today. Cherry Docs by David Gow. Directed by Richard Wolfe. A Cave Canem Production presented by Pacific Theatre. On stage at Pacific Theatre (1440 W 12th Ave, Vancouver) until April 28. Visit pacifictheatre.org for tickets and information.